A spicy cured pork sausage seasoned with paprika from Asurias in Spain, where there is a long history of fantastic food production. Try on the grill or BBQ. Warning: Hot oil may be released when product is pierced. 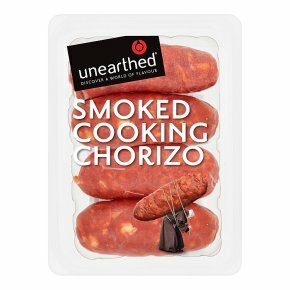 For a more authentic flavour remove packaging and place chorizo on a hot barbecue for 10-15 minutes. Check food is piping hot. All cooking appliances vary. This is a guide only.Do not reheat once cooled. Moderate heat: 8-10 minutes.Before cooking: Preheat grill. Remove all packaging and place chorizo on grill pan.During cooking: Turn occasionally until browned.After cooking: Allow to stand for 2 minutes before serving.